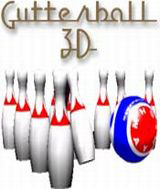 The original smash hit bowling game! Get great bowling action without the crowds or the rental shoes. Choose your ball and shoot for the big score solo, or with up to three other bowlers at once. You'll love the great graphics and amazing ball physics. Even allows you to guide the ball as it hurtles toward the pins. A great 'spin' on one of the worlds most popular sports! Bowl in three different alleys: Retro Bowl, Cosmic Lanes, and Wacky Alley. Customize your ball´s spin, weight, speed, and more. Grab any image on the web for a custom look to your ball. Cons: Pin reaction is not very good. Comments: Over all it just fun to play for bowlers to wast some time. and injoy some fun and hours of play with friends & family!!!! Comments: Sounds and Graphics are very good. Playing lanes very easy. Reminds me of Cosmic Bowling with the lighting in real bowling alleys.